Safe care environments, for both patients and caregivers, are made possible thanks to the installment of ceiling lifts offered by us at Orthopedic Service Company. 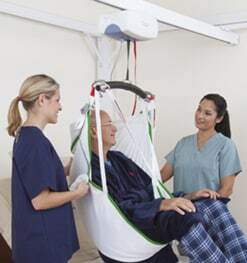 Working hand in hand with Handicare (formerly Prism Medical), one of the top brands in the market, we sell and install ceiling lifts in Raleigh, North Carolina, guiding hundreds of care facilities and home caregivers through the process of implementing safe handling techniques. Orthopedic Service Company works along with Handicare (formerly Prism Medical) to offer their clients in Raleigh, North Carolina ceiling lifts of the highest of qualities, giving access to a complete line of portable, fixed, free standing and bariatric ceiling lifts. Contact us today to find out more about the purchase and installment of ceiling lifts in Raleigh, NC.